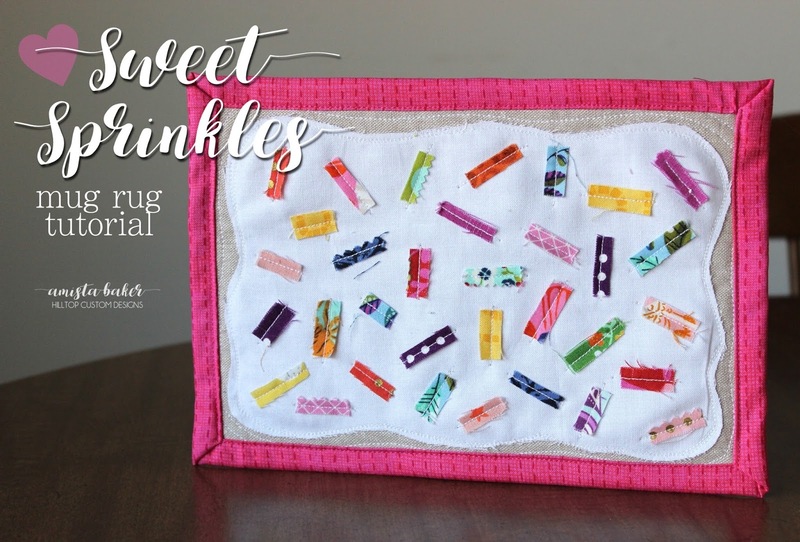 Today I want to share with you this delicious Sweet Sprinkles Mug Rug Tutorial! 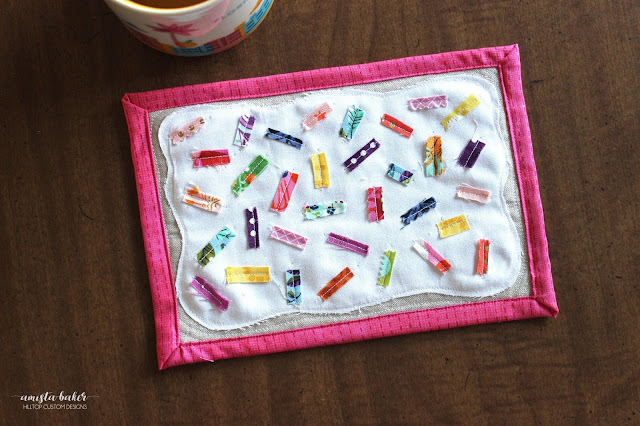 I actually had the idea for this mug rug design a few days ago when trying to come up with as many different ways as possible to use teeny tiny little scraps that are leftover from various projects. If you've visited my blog before, you'll know I aim to be as waste-free as possible with my fabric usage. 30-35 tiny scraps approx. 1/4" wide by 1/2" long. 1. Grab your piece of white "icing" fabric and draw curvy lines along the outside edges with a marking tool, then use scissors or a rotary cutter to trim off excess fabric. 2. Center the icing fabric ontop of your background piece (again, I used linen) and appliqué the icing to the background fabric. I chose to do raw edge applique, but you can use a blanket or zig zag stitch. 3. With approx. 30-35 pieces of scraps, set your straight stitch length to 2.2 or 2.4. Next, you're going to place the scraps ontop of the white appliquéd "icing" fabric one at a time and stitch them down. Simple stitch a straight line down the center of each piece, backstitching at the start and stop points. 4. 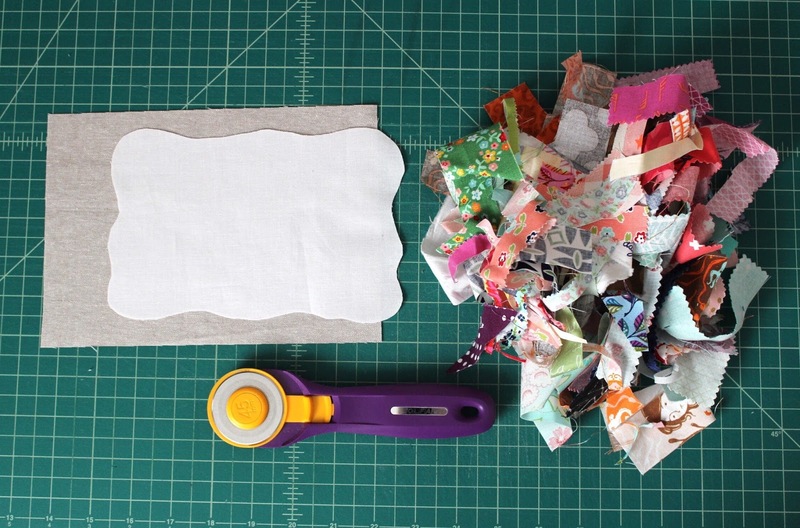 Once all pieces are stitched down use a ruler to trim your entire piece to 6" x 9" and straighten up any skewed edges. 5. Next, spray baste your top appliquéd piece and center it ontop of your backing fabric. Baste the entire outside edge of your top piece with a 1/4" seam. When you're done trim your backing piece so that it is exactly 1" wider than your top piece. "Cheater binding" instructions coming up next..
6. Now we'll begin binding our mug rug using the excess backing fabric. Start by folding the raw edge of the backing piece on one long side of the mug rug over so it touches the edge of the top appliquéd piece, then fold again and clip as show above in the last photo on the right. Repeat with the opposite side of the mug rug. 7. For the corners you'll want to fold each one inward at an angle on your short sides. Then you'll fold the raw edge of the backing piece on that side over once, then twice, just like in step 7. Repeat with all four corners and secure binding clips or pins. 8. Stitch the top of the binding down as close to the edge as possible and you're finished! I hope you enjoyed this little tutorial! The color and design options are endless, you could do so many different sweet combinations! I really like how this looks like sprinkled icing. Nicely done and thank you for linking up with the Tips and Tutorials Festival!